On September 13th 2012 ce. one of the Odinic Rite’s finest members passed from this realm. Hervor OR joined the Rite in the 70s along with her husband Asbjeorn. Both had been Odinists before joining the Rite and had long been dedicated and active in advancing our Holy religion and our Folk in both the esoteric and exoteric arenas. Hervor’s contribution to the development and advance of the Odinic Rite was profound and from the beginning she was active. In the times of peril she was one of those who stood steadfast and gave wise counsel and support on many levels. She assumed the role of editrix to ORBriefing in 1989 ce, stepping into the breach when the previous editor stepped down. Immediately she helped to develop ORB into a more vibrant and profound journal and along with this, she also was one of those who initiated the North Wind series which ran for several years. This was an annual publication designed to include longer articles which were better suited to a separate publication from ORB. And it should be remembered, she carried out this work of editing and typesetting without the aid of the computers and software that we see today, and in a time when ‘cut and paste’ literally meant that. And while performing these tasks, she also played a senior role in the Circle of Ostara. Though much of her work is best suited to fireside tales rather than cold print, it can be said that possibly the work she carried out of the most profound and influential nature was in presenting some of the Circle of Ostara’s wisdom in the two deep and revolutionary works “Odinist Mythology for the 21st Century” volumes 1 and 2. This work still remains among the most profound Odinist works available and is still considered as a radical and illuminating work today, but when it was first published by the Rite back at the start of the 1990s, it was truly revolutionary and its impact massive. It can be said that the presentation of this work was one of those pivotal moments in the development of Odinism. 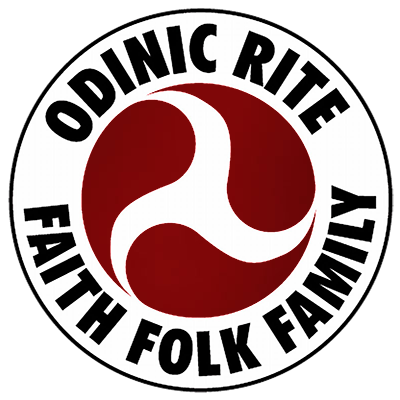 Released as it was in a time of stress and turmoil, where the Odinic Rite itself came to a cross roads which would either see it neutralised or even cease to exist in any meaningful way, or become a more profound, vital and vibrant movement. One day maybe the fuller tale of that time will be told, but all we need say on it here, is Hervor’s dedication and preparing these works, played a large part in that struggle and was instrumental in ensuring that the Rite did in fact survive this time of crisis and become a far deeper, vibrant movement. It is another work which sets us apart from the ‘let’s play Vikings’ types. This work was not only painstakingly typed up and illustrated by Hervor, but she was also its author, who devoted much time to presenting the knowledge of the Circle of Ostara in a readily available form. In many ways she was in the same mould as Else Christensen in that she can be seen as a Folk Mother, but where Else was primarily active in the more exoteric area, Hervor was very much involved in the esoteric, though her counsel on day to day matters of the Rite was often sought by members of the Court of Gothar. And like Else, she was utterly dedicated and staunch in her work to bring the New Awakening. It is a testimony to the deep respect Hervor was held in and the great gratitude felt for her loyalty and dedication that her Bael was held within the Blot of the Great Moot. Those who were fortunate enough to visit Hervor and Asbjeorn at their home in the Highlands of Scotland will long remember the warmth of such meetings. On a personal note, I will also remember Hervor for the good advice she gave to me when newly elected as DCG and her continuing counsel. At times where I may have been tempted to set out on impetuous paths, her words more than any would serve to keep me on a more positive (if arduous at times) path. She is missed by all her knew her, and her dedication will be missed by all, but we can also be pleased that the wisdom she shared and the work she presented has had major influence across Midgarth and will continue to do so. We thank you, we remember you, we hail you. Hail Hervor ! Hail Hervor ! Hail Hervor!